Until James VI of Scotland inherited the throne of England at the death of his cousin Queen Elizabeth in 1603, relations between the monarchs of the two countries were often quite volatile. James' great-grandfather, James IV, was killed by the English in the Battle of Flodden, and the news of the Scottish defeat by the English at Solway Moss was said to have killed his grandfather, James V.
Edinburgh Castle dates from the 12th century and was the seat of Scottish kings. Its 15th century Great Hall was the meeting place of the Scottish parliament until 1639. The castle was a favorite residence of Scottish rulers until the Union of Crowns in 1603, after which the king resided in England. Mary, Queen of Scots, gave birth to James VI (I of England) in a 15th century palace within the castle. The oldest building in all Edinburgh, St. Margaret's Chapel, is located within the Castle precincts. The ancient Honours of Scotland (the Crown, the Sceptre and the Sword of State) are on view in the Crown Room. At the other end of the Royal Mile from the castle is Holyrood Palace. Now the Queen's official Scottish residence, Holyrood Palace is named after the "rood" or cross which King David I is said to have seen between the antlers of a stag he was hunting in the vicinity in 1128 and which led him to establish an abbey on the site. It was at Holyrood Abbey that King James II of Scotland was born, marri ed, and buried; that Kings James III and James IV were married; that James V was crowned in 1524 and buried in 1542. Charles I was crowned in the abbey in 1633. Holyrood Palace was built in 1529 for James V and his wife Mary of Guise. The palace chapel was the site of the marriage between Mary, Queen of Scots, and Lord Darnley. A year later, Mary's secretary, David Rizzio, was murdered in the palace by the jealous Darnley. Mary's later association with Darnley's murderers led to her abdication and flight to England in 1568. Near Holyrood Park is the village of Duddingston, where Bonnie Prince Charlie held a council of war immediately prior to the Battle of Prestonpans in 1745. With the failure of the Jacobites to regain the throne, Holyrood Palace was not occupied by British monarchs again until George IV held court in the palace (and adopted Highland dress). A new Scottish Parliament was elected in 1999, following devolution of powers from the United Kingdom Parliament in London. This is the first time Scotland has had its own parliament since the Act of Union of 1707. 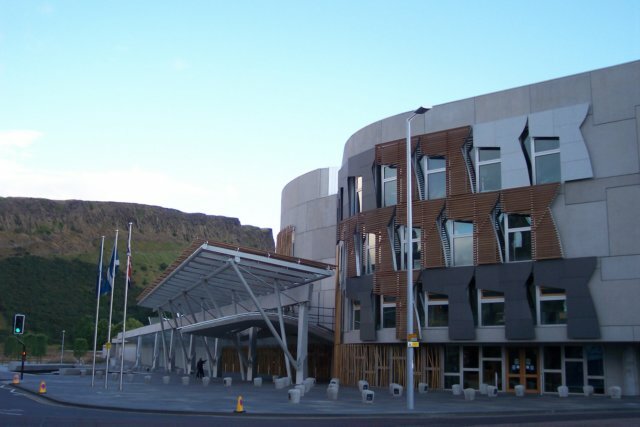 The Scottish Parliament, which sits in Edinburgh, is responsible for most aspects of Scottish life except for defense, foreign affairs and taxation. The Scottish Government is led by a First Minister. A Secretary of State for Scotland remains part of the UK Cabinet, and is supported by the Scotland Office (previously the Scottish Office) based in Glasgow, with offices in Edinburgh and London. The Scottish parliament is located at the end of the Royal Mile, across from Holyrood Palace.